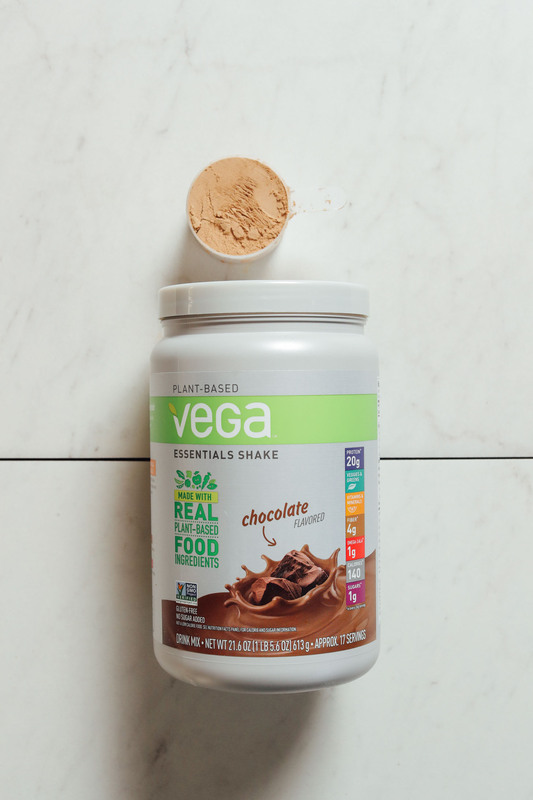 SO many of you enjoyed our Vegan Vanilla Protein Powder Review that we decided it was due time to put chocolate protein powders to the test! 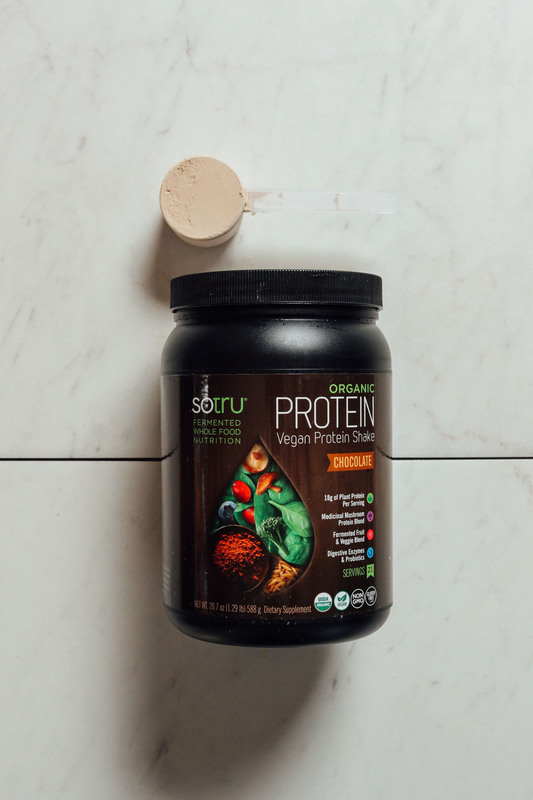 As with the vanilla powders, we did a formal, side-by-side review of some of the most popular vegan protein powders on the market. We also added in some lesser known, innovative brands. Our goal was to see which protein powders delivered on taste and nutrition and which ones weren’t worth the hype, saving you the time and money of doing the research yourself! 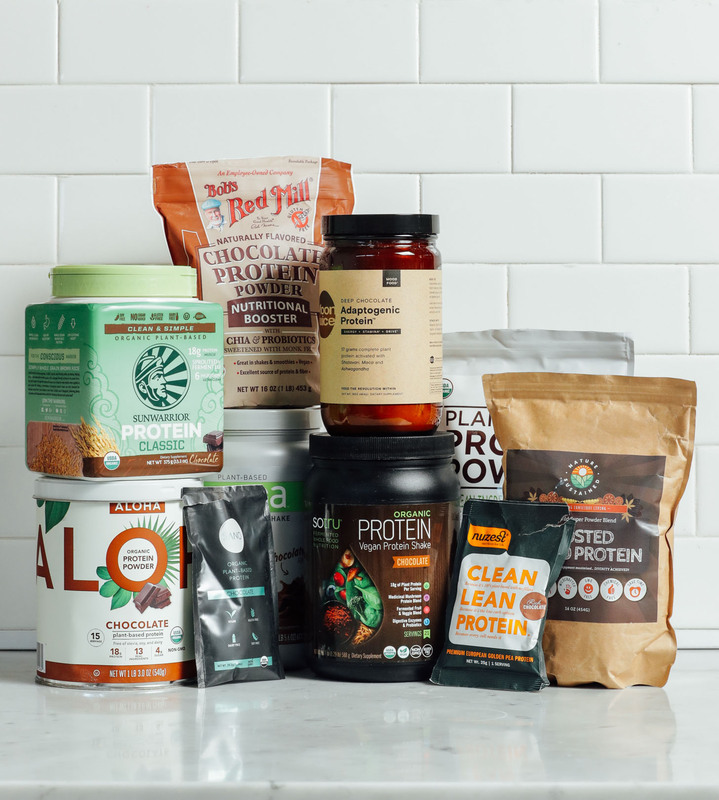 We tested 10 protein powders and only ordered those we could find on Amazon because they are most accessible to people and usually have the best prices. This review is not sponsored in any way. We were not given free product or compensated for any of our reviews, and we had no contact with any of these brands. We excluded any products containing artificial colors or sweeteners, and did our best to include products with high-quality ingredients. We tried to be as unbiased and objective as possible when reviewing. When testing powders with non-dairy milk, we mixed 1/3 cup (80 ml) Forager Unsweetened Plain Coconut Cashewmilk with 1 Tbsp (15 g) protein powder in a mason jar with 2 ice cubes then shook vigorously for 30 seconds. When testing protein powders in smoothies, we blended 1/4 large frozen banana, 1/3 cup (80 ml) Forager Unsweetened Plain Coconut Cashewmilk, 2 ice cubes, and 1 Tbsp (15 g) protein powder. We blended for 45 seconds in a small blender. Additives – potentially undesirable ingredients added to improve flavor, texture, etc. Protein is a component of all of the cells in our bodies. It supports the production of enzymes, hormones, and so much more to keep us feeling good! The Institute of Medicine has recommended that adults consume 0.80 grams of protein daily per kg of body weight. For example, it’s recommended that an adult weighing 150 pounds (68 kg) consume ~54 grams of protein per day. The protein powders tested in this review contain between 17 and 20 grams of protein per serving. Chances are, if you are eating a nutritionally balanced diet, you are probably consuming enough protein. However, for some (such as those following a vegan or vegetarian diet), it may require a little extra attention to ensure adequate protein intake is achieved. Not to mention, sometimes you’re just too busy for cooking — that’s when protein powders come in extra handy. 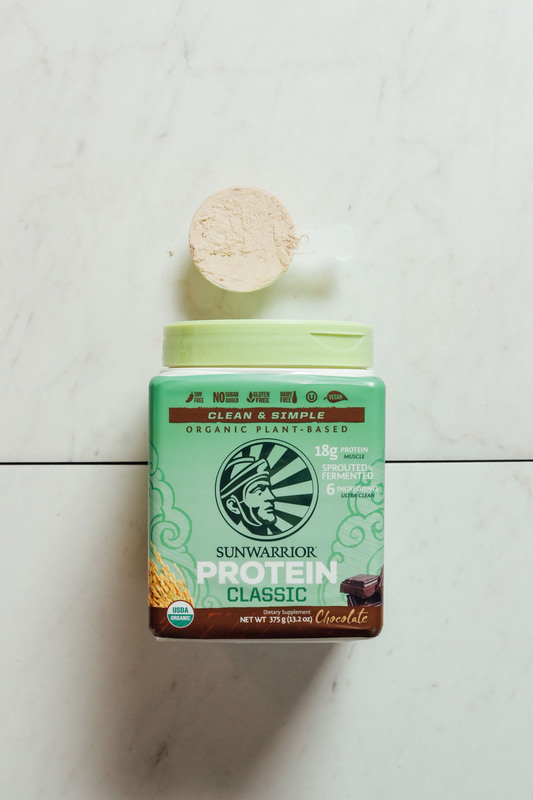 Though we prefer to have most of our meals closer to their “from the farm” roots, we find protein powders to be a great option when traveling, on-the-go, needing something simple, or when the fridge is low! Overall impressions: Overall really good, but the aftertaste was very mildly unpleasant. Reminded us of a SlimFast shake, though not necessarily in a bad way. Overall impressions: Simple ingredients, really smooth, and not chalky, but tastes like it’s trying to be too healthy. We would like it better if the chocolate flavor was more prominent and there was less sweetness. How well it tastes/blends with smoothies: 4 – smooth and creamy; chia seeds mixed well. Not too sweet. Chocolate flavor is noticeable; wish it was a little stronger. We noticed a very slightly bitter aftertaste. Overall impressions: Overall good chocolate flavor and mild sweetness. We don’t love that it includes chicory root fiber and inulin, which can contribute to digestive upset for some people. Overall it wasn’t a love, but wasn’t a hate. How well it tastes/blends with smoothies: 3.5 – nice chocolate smell. A little too sweet. Initial taste is okay, but then it goes bitter. A little grainy when blended. Slight chemical taste. Overall impressions: Overall really enjoyable, pleasant flavors, not overwhelmingly sweet, and impressive ingredients. We only wish it mixed a little better. Overall flavor: 4 – chocolate flavor is pleasant and detectable, but superfoods give a slightly unpleasant aftertaste. Mushroom powder slightly detectable. How well it tastes/blends with smoothies: 3.5 – smells good. Chocolate flavor is detectable but not very strong. Bitter. Pretty smooth. Not too sweet. Overall impressions: Impressive considering clean ingredient profile and added superfoods. Not incredible tasting but it has a pleasant chocolate flavor and no bitterness or off-putting aftertaste. We wish the texture was smoother, but overall it is good. Overall impressions: Smells off-putting, but doesn’t taste quite as bad as it smells. The chocolate flavor is not very prominent, but the artificial sweetness is overwhelming. Overall, we disliked this one. Sweetness: 3.5 – not overwhelming. Level of sweetness is good, but flavor of sweet is not great. How well it tastes/blends with smoothies: 4.5 – Much improved when blended with banana. Pretty smooth texture. Takes on a slight caramel taste when blended. Not too sweet and no artificial sweetness / flavor detected. Tastes like a chocolate shake! Overall impressions: Initial taste is off-putting, but it gets better the more you drink it (though we still don’t consider it great). We wish the chocolate flavor was more prominent. How well it tastes/blends with smoothies: 2.5 – Flavor is better blended in a smoothie than shaken. But still bitter and a subtle cardboard flavor. Chocolate flavor is not prominent, but artificial sweetness is. And it somehow remains a little grainy after blending. Overall impressions: Pleasant chocolate flavor, but followed by too much sweetness and an unpleasant aftertaste. It’s a little too chalky and overall not enjoyable. Overall flavor: 1.5 – tastes bitter, chalky, chocolate flavor is not detectable, leaves an unpleasant aftertaste. How well it tastes/blends with smoothies: 3 – The initial taste is pleasant, however it quickly turns to a bitter and almost sour flavor. The texture is also a little grainy despite blending. Not too sweet though, even with banana. Overall impressions: Simple and impressive ingredients, but not enough to counteract flavor and texture issues. It works better with something like banana that sweetens it up / masks the flavor. Still, overall unpleasant, slightly bitter flavor and chalky texture. How well it tastes/blends with smoothies: 2 – Has a funky smell and cardboard and mushroom flavors; even when blended has some powdery-ness, but overall, use in a smoothie was way better than just shaken with dairy-free milk. Overall impressions: Maybe the worst protein we have ever tasted. It doesn’t have any pleasant qualities on its own and is significantly more expensive than most protein powders. We tried to be extremely honest in this review, which is why it seems like a lot of the feedback was critical or negative. That’s because we honestly didn’t like many of the protein powders we tried. But the standouts are definitely the top 3 (above), with numbers 4 and 5 being quite tasty, too. *Despite Minimalist Baker having had a working relationship with Bob’s Red Mill in the past (which has since been discontinued), our relationship with them had nothing to do with this review. We had no communication with them about it. This post is entirely unsponsored. *This post contains affiliate links. In the case that you would purchase something using our link, we receive a small commission from Amazon which helps support our work here. 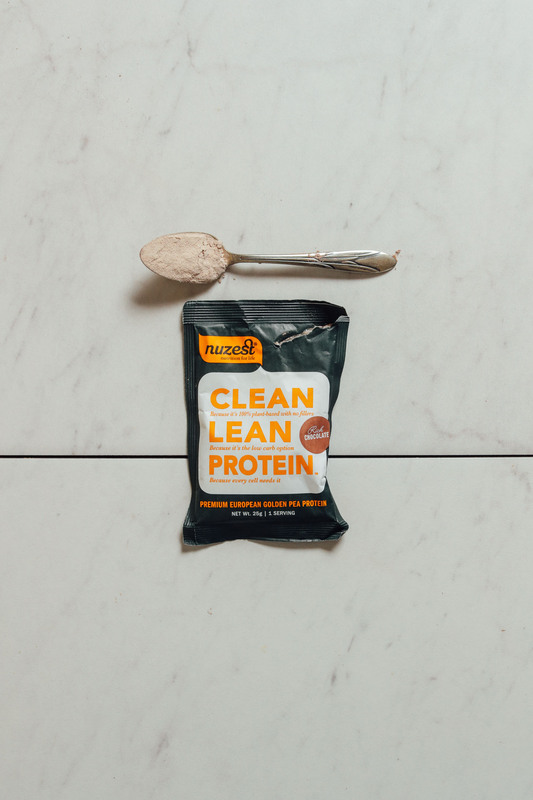 MyProtein has excellent prices on clean pea protein, brown rice protein, and a blend of each, in chocolate and vanilla. Tastes pretty good (especially the chocolate, vanilla can be chalky unless mixed with some other flavors) but the price can’t be beat! One of the things that skyrocketed in price when my wife and I went vegan a few months ago was the cost of protein powder. We both lift and thus go through a ton of the stuff. 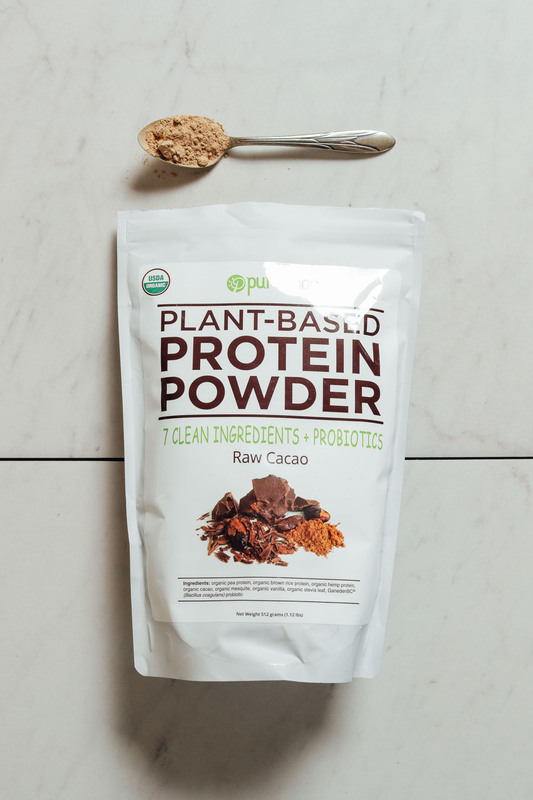 Whey protein is cheaper than dirt, but these fancy vegan blends cost an arm and a leg. Can’t be dropping $50/week on protein alone. Then I found MyProtein and I got 13 total pounds for $55 on a sale. Can’t beat that and the ingredients are straight up protein. 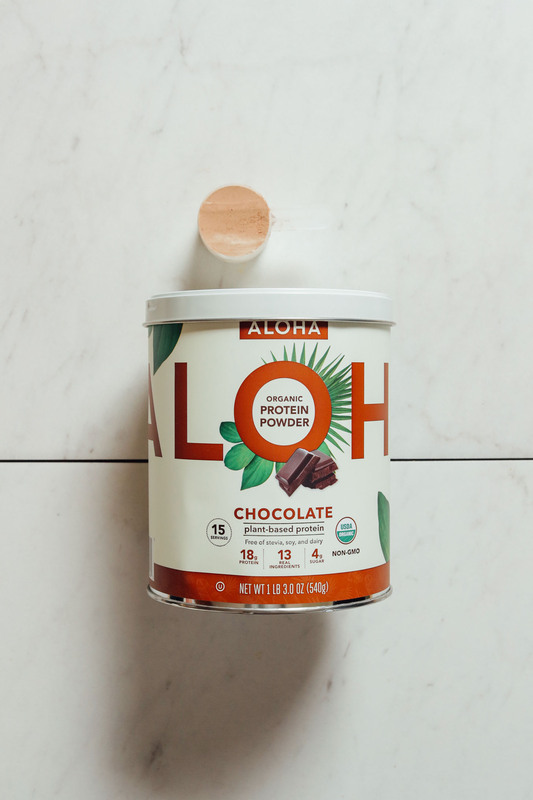 We generally use this brand of protein for morning oats, but we still buy the fancy stuff from Whole Foods for the occasion straight-up protein shake when we want a bit more flavor. Have you tried Arbonne’s protein powders? They are my favorite. I’d be curious to see where they fall on this scale. We haven’t! But thanks for the recommendation! This is so great, thank you! 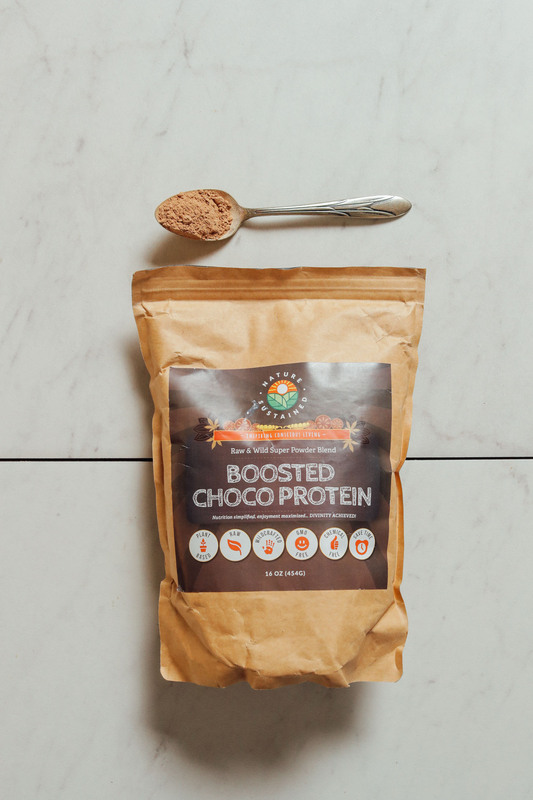 I highly recommend KOS protein powder as well, it comes in chocolate and vanilla and is all plant based – They also have pantry products that are organic and plant based supplements to add to recipes! Good to know! Thanks for sharing, JD. Thanks for taking the time to perform these unbiased/not sponsored reviews on vegan protein powders. 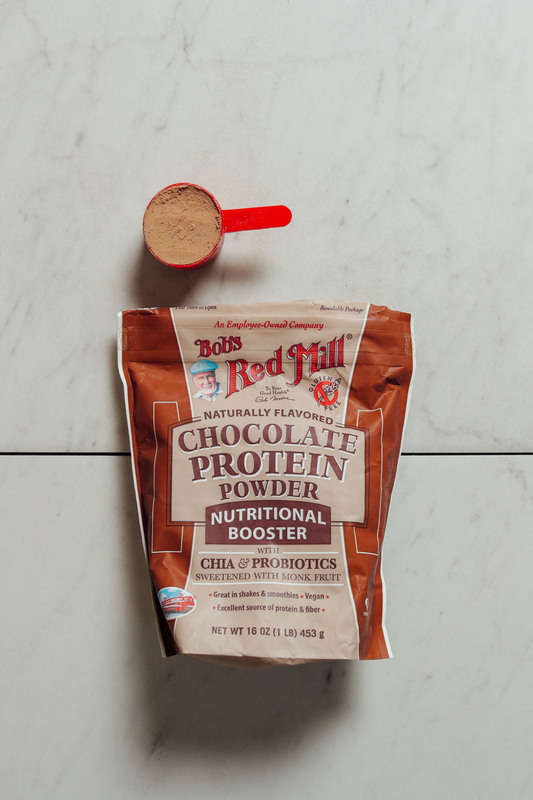 After reading your previous vanilla protein powder review, I went out and bought the Bob’s Red Mill, a brand I otherwise would’ve overlooked completely when it comes to protein powder. I enjoyed it. Since then I’ve discovered Vivo Life vegan protein powder and it’s my new all time favorite! Have you heard of/tested this brand? They have cleanly sourced ingredients and the highest vegan protein content per serving (25 grams) I’ve come across for the calories. I also appreciate the fact that the company doesn’t use a plastic tub to package their products, but rather a resealable bag. Hi Andrea, we aren’t familiar with that brand. Thanks for sharing! Thank you! These lists have been so helpful in hunting down my favorite vegan protein! You’ve done it again, Dana! Thanks for taking one for the team and trying all these for us :) I appreciate your honest opinions. Very interesting and helpful! Thank you ! Can you tell me what you know about Garden of Life brand? I’m just curious why this wasn’t tested. Is it because of the heavy metals? Hi there, we did not include it because it contains erythritol, which is a sugar alcohol and may cause digestive upset. Thanks Dana! I purchased the Aloha brand that you recommend and we love it. You should try Tropeka. The Boost is a chocolate/caramel protein, delicious. I haven’t tried their straight chocolate, but the salted caramel is amazing with almond milk an a frozen banana (I don’t, however, rate their vanilla). I actually do enjoy Tropeaka’s vanilla flavor – great ingredients! However, for now it seems it’s only available in Australia and the shipping costs were high. So I tried to include only protein powders that were accessible on Amazon. Have you ever tried Orgain protein powders? They are the tastiest vegan protein powders I’ve ever had. (Peanut butter is my fave!) I was wondering why you hadn’t reviewed them or if you knew of any adverse effects. We did test the Vanilla Orgain! You can see that in our vanilla protein powder review. 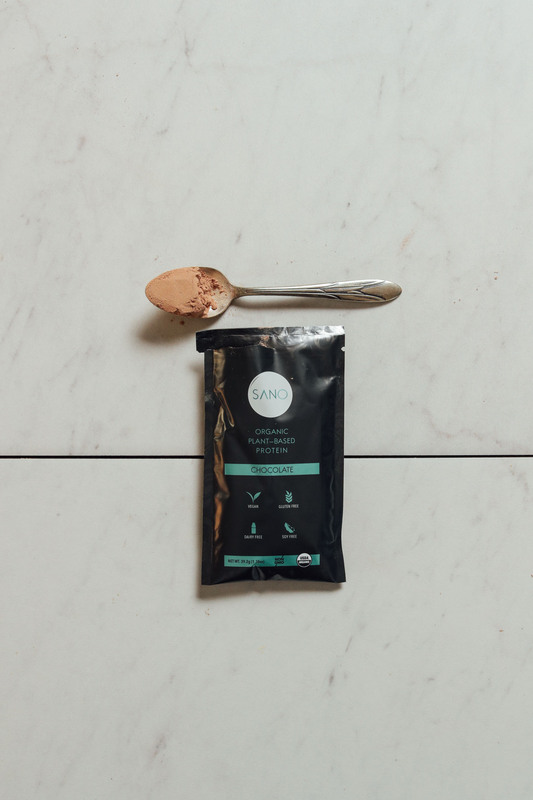 We didn’t test the chocolate, however, because erythritol was an ingredient and from a nutrition/digestion standpoint it can be a problem for some. Thank for your review! I was wondering if you considered Orgain for this review as it seems pretty popular. Does anyone know how it compares to the top choices here? Thanks! ALOHA is my FAVORITE!! happy to see it made FIRST PLACE!! I love this powder for a lot of reasons, one of them is that it blends so well EVEN WITHOUT A BLENDER!! so it travels well. Right? Yay! So glad you like it, too! I’m curious why Orgain chocolate fudge powder didn’t make the cut? Have you tried Ora brand protein? I just started using it and it’s awesome! Glad you like it! We considered it for the review but ultimately didn’t order! I second Aryn, the co-owners of Ora Organica are regulars at the coffeeshop I work at & they are extremely lovely people who make really excellent supplement products! I hope you check them out, their chocolate protein powder is the only one I’ve ever liked! To us, it had the most off-putting flavor and didn’t register as chocolate (on its own) at all. But I’m so glad you like it! The ingredient list IS impressive. This is so helpful! I was reading the reviews you did on the vanilla ones the other day and was wishing you had a review for chocolate ones, and then I got an email about this! 😀 Have you tried any of the chocolate or salted caramel flavored protein powders from Tropeaka? I’ve been really curious about them! I have! Their vanilla is great. Glad you like their stuff, too! Something I didn’t see mentioned that I think is extremely important: these products are NOT regulated by the FDA. This means that their listed ingredients are not necessarily what is actually in the package. My husband, a scientist, tested a brand I won’t name for obvious reasons, and discovered that the major ingredient this brand said was included in their product was not detected AT ALL. Their celebrity fitness “expert” touted the specific ingredient my husband was looking for as its prime ingredient and it just wasn’t there. My husband ordered several packages from several different retailers so he would get a random sampling of the product. All the packages were tested. I find that lack of oversight on these products frightening. You could also go to Dr. Oz’s web page and look up similar testing his show did on protein powders to see if your brand was tested for accuracy of ingredients. I know Dr. Oz has lost a lot of credibility because he appears to have sold out to junk science, but this was one of the last studies his show did that was actually right on the money! Hi Erin, thank you for sharing your experience and information. Our understanding is that manufacturers are “prohibited [by the FDA] from marketing products that are adulterated or misbranded.” We understand that there may be brands that are not in compliance and that is unfortunate. We did our best to try to select brands with integrity and high-quality ingredients. Thanks for this. I make my own with cacao, the protien powder of my choice (I use a blend) and a few drops of stevia (occasionally maple syrup if I am splurging). I have a smoothie with assorted frozen fruits and this almost daily and it is delicious! My new favorite is Epic Sprout Living Chocolate Maca. It’s available on Amazon too. I alternate between that and Aloha usually. You should check out Zenberry! This is perfect timing! I have been searching for a new vegan protein powder. It’s SO hard, either the taste is absolutely horrible or it contains things like maca (I realized I am SUPER intolerant to that) or chicory/inulin which in larger quantities does not make me feel good at all. I am going to try one of these, I usually prefer vanilla because I like to mix with fruit but my go to lately has been hard to find. Growing Naturals Vanilla Blast (it’s super awesome with Mango) It’s great to have a good chocolate powder on hand too to mix things up a bit. I also try to limit inulin (for digestive health)! Thanks for sharing your tips! My fav chocolate protein powder is Growing Naturals, Pea or Rice. Seems to be back in stock everywhere now, including their website. Good to know, I haven’t had a smoothie in months! I haven’t tried the chocolate one, just the vanilla but it is tasty. If you mix the pea and the rice together it’s healthier, but the rice one seems harder to find for some reason. Thanks for the review Dana! Has anyone had the PB2 (powdered peanut butter) in addition to any of the above? 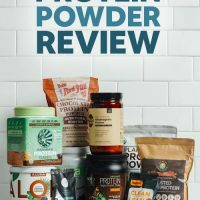 That’s been my only intro to chocolate protein powder so I’d love to know how PB2 stacks up against the ones reviewed in this post. I do tend to keep a powdered PB on hand for adding flavor to smoothies as well! Thanks for the detailed breakdown. I can’t stand the aftertaste of stevia, so it was nice to see you specify the type of sweetener used in each powder! If you consume protein powder and find yourself with joint pain, check the ingredients. In my experience, pea protein causes outrageous joint pain (for me, it’s concentrated in my knuckles) within a half hour of consuming it. I thought I must be unique in experiencing this, but discovered a lot of people are having the same issue. I avoid anything with pea protein like the plague now! Related, I was a huge GoMacro MacroBar fan until they recently changed their ingredients to include pea protein. Thanks for sharing your experience, Jen! Thanks for the review, Dana. I do love your blog. Another important criterium for me is plastic/not plastic container. Also, since Bob Red Mill is non organic, I would imagine their cornstarch is GMO – a no no for me. Would you have an idea about getting enough protein in a more natural way? (I do eat lots of beans). Lentils are my go-to high protein option. I can do organic, non-GMO soy in limited amounts. Otherwise nuts and seeds! I’m sharing my go-to protein powder-free “protein shake” soon! Wonderful. Thank you so much Dana! Wow, thank you for sharing that. I did not know that and wouldn’t have even thought that was my issue. Thanks! Hi Marianne, thanks for sharing the concern! 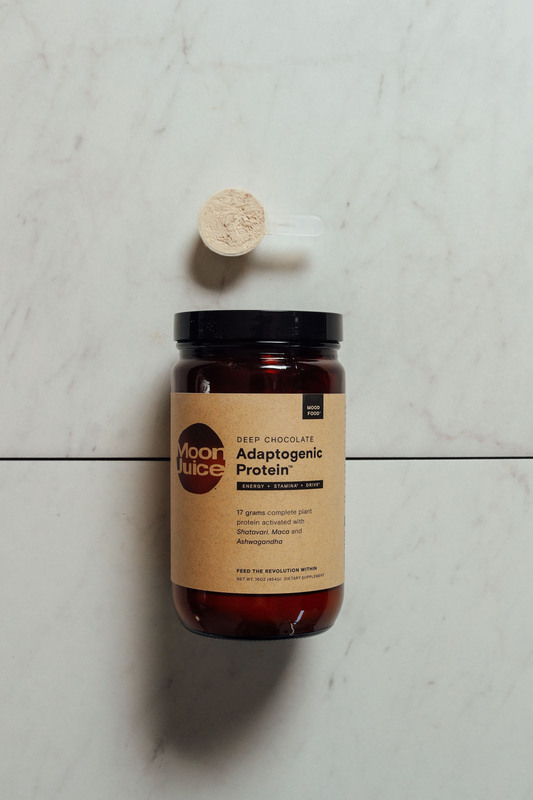 We are familiar with some of the testing out there on protein powders which is why we mention “we prefer to have most of our meals closer to their “from the farm” roots…[but] we find protein powders to be a great option when traveling, on-the-go, needing something simple, or when the fridge is low.” Unfortunately not all of the brands out there have been tested so it is hard to know whether this is a problem with protein powders in general or specific brands. Thanks again! This was such an interesting read. I also went back and read your vanilla protein powder review. I’m really intrigued by the idea of being able to use a mason jar to shake up the powder and non-dairy milk. I hope you do more of these reviews, especially for chai flavored (my favorite) powders!